A selection of articles about communication written by Silvinformation and published in News & Views, the newsletter of SNS – Nordic Forest Research. All articles have also been published in Scandinavian Journal of Forest Research. The newsletters, published 8 times per year, mixes articles about research cooperation, education and forest research news, all with a Nordic dimension in mind. 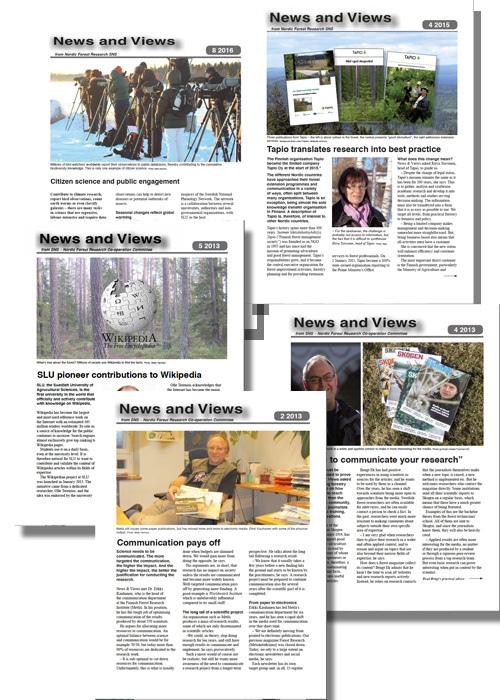 All issues of News & Views can be downloaded from Nordic Forest Research website. “Publication pays off”. About the new funding system for research in Norway. N&V No. 1, 2009. “The internet is foremost in the new SLU communication policy”. Interview with Tina Zethraeus, head of information at SLU. N&V No. 3, 2010. “Open Access – a challenge for the scientific community”. Interviews with researcher, funding agency and publisher. N&V No. 1, 2011. “SNS has opened its new portal”. About the new website of SNS. N&V No. 4, 2011. “Nordic research frequently cited”. About research and publication impact. N&V No. 5, 2011. “New website disseminates Nordic and Baltic forest research”. About NBforest.info. N&V No. 1, 2012. “Wood Material Science and Engineering, an important player in wood science publication”. Presentation of one of the journals under SNS. N&V No. 5, 2012. “Communication pays off”. Interview with Erkki Kauhanen, Metla. N&V No. 2, 2013. “Use me to communicate your research”. Interview with Bengt Ek, chief editor of Skogen. N&V No. 4, 2013. “SLU pioneer contributions to Wikipedia”. Interview with Olle Terenius about the Wikipedia project. N&V 5, 2013. “Waldwissen.net – translates research into practice”. About Waldwissen. N&V No. 2, 2014. “New technology challenges university learning”. Short interview with Thomas Fürth, Kairos Future. N&V No. 4, 2014. “Scientific writing is telling and selling a story”. Interview with John Blackwell, SEES-Editing. N&V No. 1, 2015. “Tapio translates research into best practice”. Interview with Ritva Toivonen, head of Tapio. N&V No. 4, 2015. “Put pressure on the researchers to communicate”. Interview with Professor Lena Gustafsson about the need to popularize research. N&V No. 2, 2016. “Research communicators: press-releases are key”. From a survey in Journalism Trends. N&V No. 5, 2016. “Citizen science and public engagement”. About the growing phenomenon citizen science. N&V No. 8, 2016. “Time to get a joint grip on Nordic science communication“. From a Nordic workshop on forest communication. N&V No. 1, 2017. “Formas: ‘Communication must be integrated'”. Interview with Elisabet Göransson about the communication strategy of a research council. N&V No. 5, 2017. Say it in English, please! An appeal to national forest research organisations to summarize research findings for an international audience. NBForest Blog, 18 Oct. 2013.